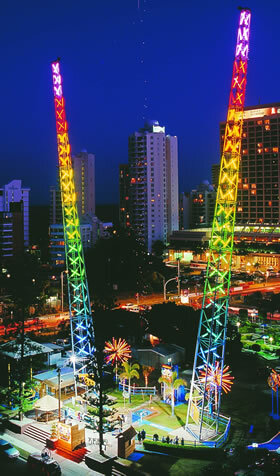 This innovative Slingshot™ amusement device is by far one the most exciting vertical amusement rides available today. 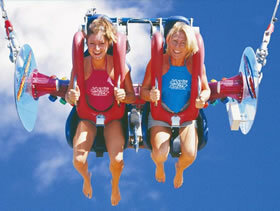 Slingshot™ passengers are propelled over 100 metres at speeds in the region of 160 kilometers per hour. The Slingshot™ machine does not utilize rubber ropes or bungee cords but is powered by a patented spring propulsion device incorporating up to 720 specially designed springs. The Slingshot™ can be custom designed to cause minimal disruption to existing venues. This includes tower designs that consume a few square metres of land and use elevated gondola loading platforms where space is at a premium. For the ultimate thrill ride Funtime have Slingshot™ designs able to propel the passenger capsule more than 150 metres high. Other designs are available that have a passenger capacity of around 240 passengers per hour.